Welcome to AyrtonLIVE issue 11. First and foremost in this issue we pay tribute to our dear friend Valère Huart Gyors, who left us in early February to add another star to the firmament. Tributes have been paid across the industry to the man who exported Ayrton across the world after joining us in 2010 at the start of what became a new age for Ayrton. In 2017 Ayrton reaches its 15th anniversary and, by way of celebration, we are proud to introduce a new line of luminaires, with product names that evoke the winds of the world. The new names symbolise the lightness embodied in the fixtures, along with the fluidity of design and breath of innovation that Ayrton brings to the marketplace of entertainment lighting. The first luminaire in this new line is a technological marvel called Merak™ which will make its debut at Prolight + Sound 2017, alongside the latest ArcaLine™ model, ArcaLine™3, and the fabulous new MagicBlade™FX. Full details of all three of these new products can be found in the pages of AyrtonLIVE 11. Also in this issue, we have a bumper crop of show reports which showcase Ayrton products as they put to spectacular use by some of the world’s top lighting designers. 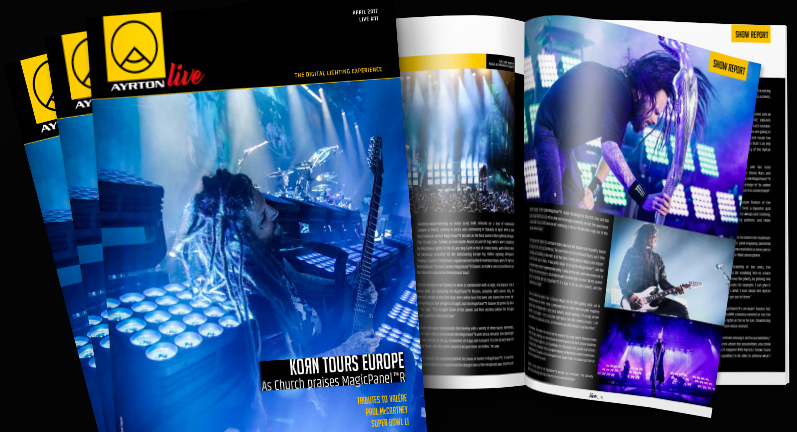 Paul McCartney, Justin Bieber and Lady Gaga rub shoulders in these pages with Korn, Florida Georgia Line, Rob Thomas, Silly and Opeth – a fantastic line up by any account! With such a diverse range of artists, designers LeRoy Bennett, Mitch Schellenger, Bob Barnhard, Cory FitzGerald, Thomas Christmann, Klaus Bolte, Magnus Boyd and the team from Silent House, demonstrate in their immense creativity in putting the incredibly versatile Ayrton product range to so many different uses. The show reports are interspersed with in-depth interviews conducted by SoundLightUP: the first is with Jean-Philippe Bourdon, director of photography, regarding his work on a televised production of Les Enfoirés; the second is an exclusive interview with electro-dance sensation, Vitalic, and the team from All Access Design who sent him on the road with his own spaceship! We hope you will enjoy the read, and look forward to another successful year together.